Fill out our simple form and get quotes from local Wedding Celebrants. First question - what is wedding celebrant hire? Well, a wedding celebrant is basically someone who is professionally trained to help you plan and celebrate your perfect wedding ceremony. 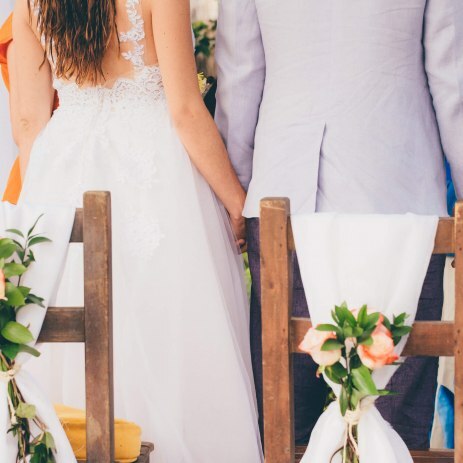 Although they can’t legally marry a couple - this needs to be done separately from the ceremony - wedding celebrant hire can be a great option for a variety of reasons. Maybe you’re a couple from a mixed-faith background or you’ve got a dream ceremony in mind and need someone to help pull it off? Or maybe you just want to do something out of the ordinary, whilst keeping some elements of a traditional wedding. If you fall into any of these categories then wedding celebrant hire could be for you. To find out more and to hear from the best wedding celebrants to hire in your area, simply complete a request form. Most wedding celebrant hire will have no restrictions in terms of format, which means you can personalise your ceremony to your heart’s content. Unlike traditional wedding services, wedding celebrant hire usually encourages guests from your wedding party to come forward with readings, songs or involvement in some way, to build a community feel. Most wedding celebrants will have a wealth of experience in helping couples come together so will be able to offer you advice if you’re still searching for the right ideas. Complete a request form today to hear about wedding celebrant hire in your area.